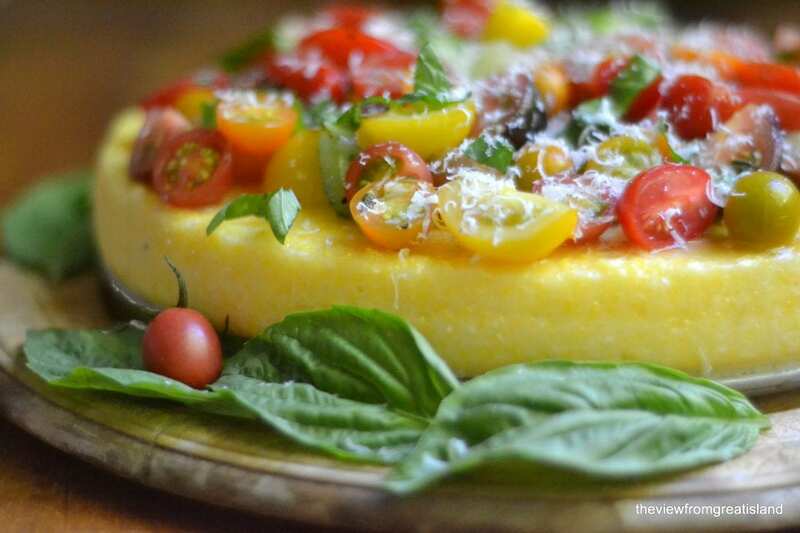 My Polenta Tart with Heirloom Tomatoes is an easy but spectacular way to showcase summer’s bounty. This savory veggie tart will be the centerpiece of any summer feast. Heirloom tomatoes have been in the stores now for a month or so. But it’s when they start showing up at the farmer’s markets that you know they’re going to be amazing. I found my first little baskets of these beauties this week, and I envisioned this Polenta Tart with Heirloom Tomatoes right on the spot. 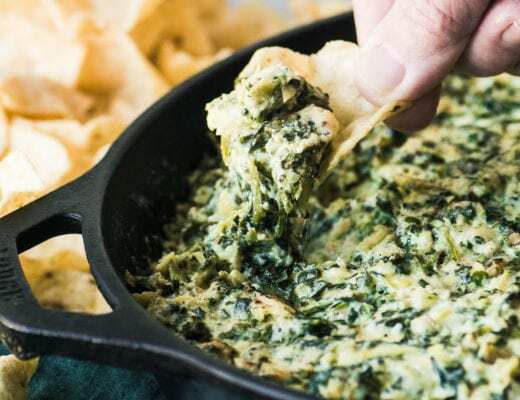 This is a fun dish to make and serve, it takes hardly any effort, but has a lot of presence. 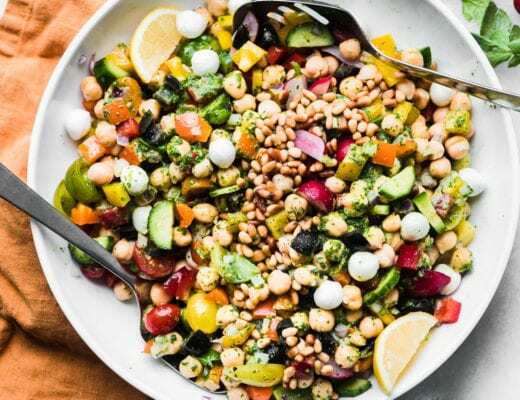 It would be a great light alfresco lunch with a green salad and a glass of wine, or a beautiful centerpiece on a summer buffet table. Polenta is such an easy dish to make, and I love how well it cooperates with you—it happily takes on any shape you choose. It pops right out of the springform pan and makes a perfect base for these tomatoes. The tomato topping is basically just a form of the Italian ‘cecca’ sauce, which is an uncooked tomato sauce made with ripe tomatoes, a little garlic, basil, and olive oil. I add a little white wine vinegar for a pop of flavor. 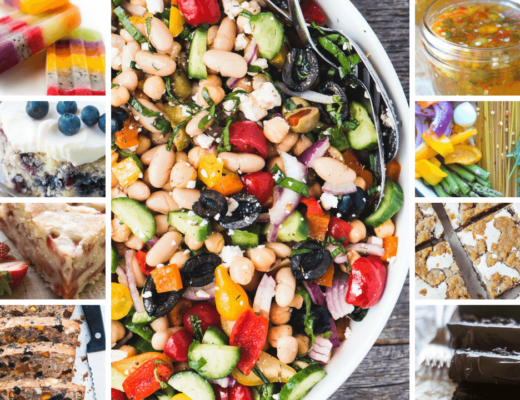 It’s great over pasta or on toasted bread, too. The keys to success with this dish are one, to season the polenta really well with butter and good quality cheese, and to use fresh ripe tomatoes. The nice thing about this is that you can throw it together easily on a day when you happen to come across spectacular tomatoes. You should always have a package of polenta in your cupboard and Parmesan cheese in the fridge anyway, so you should be good to go. Notes: This is meant to be served at room temperature, or slightly chilled. Assemble your tomato topping about an hour before serving. You can make the polenta base ahead of time and keep in the refrigerator, but tomatoes don’t do well in the fridge, and you want them to be as fresh as possible. 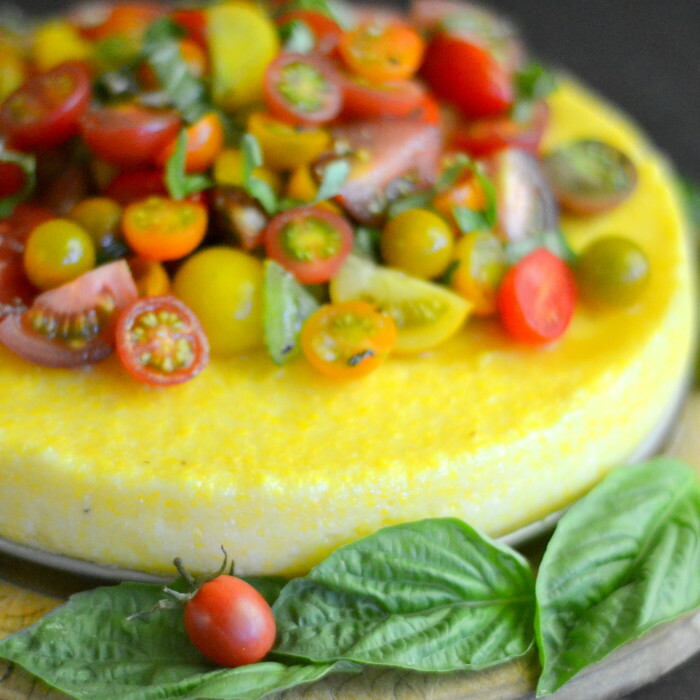 My Polenta Tart with Heirloom Tomatoes is an easy but spectacular way to showcase summer's bounty. This savory tart will be the centerpiece of any summer feast. Bring the water, milk and salt to a boil in a heavy bottomed pot. Slowly add in the polenta, stirring to avoid lumps. Lower the heat and let it cook gently for about 15 minutes. You will have to stir it most of the time. I like to use a silicone spatula. Be careful because the polenta with splatter as it bubbles, and it's hot. Take it off the heat and add the butter and the cheese. Mix well. Add some fresh cracked black pepper, and then taste and adjust the seasonings, if necessary. Pour the polenta into a greased 9" springform pan. (Note: I did not use quite all of the polenta because I didn't want my tart to be too thick.) Smooth it out quickly so the top is level. The polenta will begin to set up immediately. Let the polenta cool. You can remove it from the pan and then refrigerate it if you are not going to serve it shortly. Meanwhile make the tomato topping. Do this no more than one hour before you want to serve the tart. Slice your cherry tomatoes in half. You can cut the larger ones in wedges, and leave the very tiniest ones whole. Chop the regular sized tomato in small chunks. Put them in a bowl with all the juices and add the oil, vinegar, garlic, salt and pepper. Just before you are ready to serve it, put the polenta tart on a platter or large plate. Spoon the tomatoes and their juices on top of the polenta. Don't worry if some fall off the side onto the plate, this is supposed to be a rustic dish. Garnish with some more basil leaves and sprinkle generously with Parmesan cheese. Slice with a sharp knife and serve with more cheese. This tart sounds delicious! I’ll be looking for an opportunity to make it. a polenta tart? what fun! this is a unique idea, and the beautiful heirloom tomatoes make it even more outstanding. i am actually in love with this tart. i have to get the family’s approval (which shouldn’t be a problem) but i feel like this could be a vacation dinner some night. we basically swim in tomatoes when we’re there, so it’s perfect. I’ve looked at this post about 5 times since yesterday–I’m a little obsessed with it! It’s such a great idea and doesn’t look hard at all–while still managing to be elegant. Great idea. How pretty are those heirloom colours. OH MY. I definitely must make this when my backyard tomatoes ripen! Such a terrific idea for summer tomatoes! Can’t wait till they’re ready for picking!!! I love polenta, such a gorgeous presentation!